What’s all the hype about the Swine Flu? You can get a slue of info on Wikipedia about the Swine Flu. I’m just going to touch on a few points, but you’re always the judge. Judge what’s best for your family and always practice good hygiene and cleanliness. Swine influenza (also swine flu) refers to influenza caused by any strain of the influenza virus endemic in pigs (swine). Strains endemic in swine are called swine influenza virus (SIV). In humans, the symptoms of swine flu are similar to those of influenza and of influenza-like illness in general, namely chills, fever, sore throat, muscle pains, severe headache, coughing, weakness and general discomfort. The strain responsible for the 2009 swine flu outbreak in most cases causes only mild symptoms and the infected person makes a full recovery without requiring medical attention and without the use of antiviral medicines. Because the potential for a swine flu pandemic is now present, it is helpful to compare the current epidemic with those of earlier periods. The chart below gives figures for either worldwide or the U.S., depending on what figures were available. It is believed to be spread between humans through coughing or sneezing of infected people and touching something with the virus on it and then touching their own nose or mouth. Swine flu cannot be spread by pork products, since the virus is not transmitted through food. The swine flu in humans is most contagious during the first five days of the illness although some people, most commonly children, can remain contagious for up to ten days. Diagnosis can be made by sending a specimen, collected during the first five days, to the CDC for analysis. How to keep myself healthy? 1. If you have what you think are symptoms of flu, call your doctor - DON’T just go see him/her - if you do you might contaminate others on the way. 2. If you are found to be sick, stay HOME - do NOT go to work or school, etc and contaminate others. 3. When you cough or sneeze, cover your nose and mouth so the germs do not go out into the air. This is just common sense and common courtesy that we should do anyway but now its more important. * Possibly carry a handkerchief if you’re sneezing a lot. 4. Wash your hands frequently - especially after touching things (keyboards, phones, doorknobs, etc) - use hot water and soap for 20 seconds or more or hand sanitizers such as Prell or equivalent. 5. Keep your bare hands away from your eyes, nose, mouth. 6. Eat nutritious food, lots of liquids [no alcohol....but you already knew that -- LOL], get good sleep, reduce stress as much as you can [right] and be physically active. 7. If you wear a mask be sure it is form fitted around your nose and mouth. **After years and years of using latex gloves most medical institutions have switched to non-latex for the safety factor. See you might be called upon to work on someone that is Latex sensitive and cause more harm than good, even if you don’t have a latex allergy. Nitrile type gloves have the best strength/stretch/protection of the current crop of gloves. ***You are not suppose to sneeze in your arm pit it is supposed to be in your elbow. The reason for that is that covering your mouth with your hand then being the “good” brother or sister and shaking hands with everyone spreads the disease rapidly. having a pocket alcohol based hand cleaner and washing with that (you don’t have to rinse) is a safe albeit paranoid way of making sure that you won’t get the bug from shaking hands. Best way is if YOU don’t feel good stay home from Church, or anywhere else until you feel better. IF it becomes a major problem the Reserve Medical Corps would be the people who would distribute any vaccinations / flu shots. Joining their organization could put you on the top of the list of people to get the medicine. Just a thought! Maybe you should join? Special thanks to Terry and Cory for the info provided above. 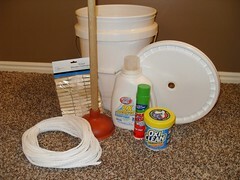 During a disaster “just plan on losing your utilities.” It is important to have a Sanitation Kit because we don’t know when our disaster will be. The lack of proper sanitation can cause the spread of disease and even death. Directions: Empty contents of the bucket. 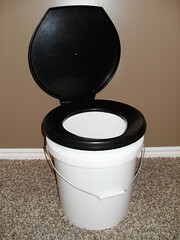 Line the bucket with a heavy duty disposable garbage bag. Put 1 tablespoon “Super Sorb” into the garbage bag. Securely attach “Luggable Loo” lid. Keep lid closed when not in use. 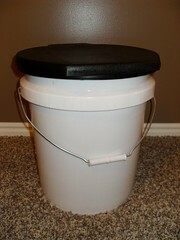 When bucket is 1/3 full, empty it by tying the bag up and disposing of it properly. * Google “luggable loo” to find the best prices and locations for you. Place water, small amount of detergent, and clothes in bucket. Move plunger up and down for a few minutes or until clothes are clean. Remove soapy clothes and ring them out. Place soapy clothes in bucket and fill with clear, clean water. Add 1/2 cup vinegar to rinse water. Move plunger up and down to rinse clothing. Wring out clothes and hang to dry. Conserve water - use rinse water for next load of laundry. NOTE: You could store two 5-gallon buckets, stack one inside of the other. Use one bucket for the soapy water and the other for the rinse water. You may be able to wash and rinse a couple of batches of clothes without changing the soapy water depending on how dirty the clothes are. Just wanted to let you all know that the November newsletter is now available to view or download online. We’ve included 7 tips on how to stay healthy during a Pandemic and how to stay healthy to avoid the Flu. These come in handy especially now before the Winter starts. In addition to having a bad odor and taste, contaminated water can contain microorganisms that cause diseases such as dysentery, typhoid and hepatitis. You should purify all water of uncertain purity before using it for drinking, food preparation or hygiene. There are many ways to purify water. None is perfect. Often the best solution is a combination of methods. Two easy purification methods are outlined below. These measures will kill most microbes but will not remove other contaminants such as heavy metals, salts and most other chemicals. Before purifying, let any suspended particles settle to the bottom, or strain them through layers of paper towel, coffee filter, or clean cloth. 1.Boiling: Boiling is the safest method of purifying water. Bring water to a rolling boil for 3-5 minutes, keeping in mind that some water will evaporate. Let the water cool before drinking. 2.Disinfection: You can use household liquid bleach to kill microorganisms. Use only regular household liquid bleach that contains 5.25 percent sodium hypochlorite. Do not use scented bleaches, color-safe bleaches, or bleaches with added cleaners. The only agent used to purify water should be household liquid bleach. Iodine, water treatment products sold in camping or surplus stores, and other chemicals that do not contain 5.25 percent sodium hypochlorite as the only active ingredient, are not recommended and should not be used. 3.Distillation: Distillation involves boiling water and then collecting the vapor that condenses back to water. The condensed vapor will not include salt and other impurities. 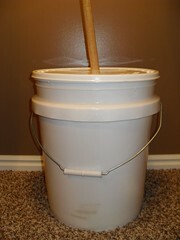 To distill, use a clean pot with a lid that has a knob-type handle in the center. Fill the pot halfway with water. Turn the pot’s lid upside-down and tie a cup under the handle, so that the cup will hang right-side-up (make sure the cup is not dangling into the water) and boil the water for 20 minutes. The water that drips from the lid into the cup is distilled. Be sure that the water you are treating is drinking-quality water to begin with. To treat water for storage, use liquid household chlorine bleach that contains 5.25 percent sodium hypochlorite. Do not use bleach with soaps or scents added. Add the bleach according to the table below, using a clean, uncontaminated medicine dropper. In order to properly “shelter-in-place” find a place that you can shut yourself in and stay put. (Hopefully the place you shelter in is really close or where you already are.) This would be necessary to do when something catastrophic happens and it is no longer safe to stay outside. Examples of this could be a natural disaster, hazardous materials release, highly volatile airborne pathogens, zombie incursion, etc. Really, this is the safest thing to do in most cases unless you are told by authorities to leave. (Remember when your mom told you “If you get lost, stay put.” Same idea-you’re easier to locate and things usually go better if you’re not out wandering with the undead or highly radioactive materials. All jesting aside, when you shelter in place properly, you’ll end up being a lot safer until you know for sure what’s going on. A lot of panicking people=crowded freeways, mass hysteria, and bad stuff happening outside. Stay put, stay calm, and stay safe. Close and lock windows and doors to the outside. Turn off anything that circulates air or vents to the outside (heater, AC, fans, fireplace etc.) also tape up little cracks and openings to the outside with tape and put damp towels on door bottoms. If accessible, get your 72 hour kit. Go to an above ground interior room with no windows. Don’t panic and don’t call 911 unless there is an immediate threat to life. For example, if someone has lost an appendage it would be OK to call; on the other hand if they’ve got a paper cut or are just scared, don’t call. Keep the radio on and wait for further instructions. For more information, see diagram A and here are some really good websites I found. A contagious disease emergency could affect many people. It could cause mild illness, hospitalization, or death in rare cases. In the event of an infectious disease emergency, the Utah Department of Public Health will provide up-to-date information and instructions to the public through media and public outreach sources. To find out how to prepare yourself and your family for a contagious disease emergency, visit the Utah Department of Public Health’s Communicable Disease Control and Prevention site. This site also provides information on what Utah is doing to prepare for an avian or pandemic flu emergency, including mass distribution of medications or vaccines. Know the principles of sanitation, how deep and how wide to dig an area for waste products, depending upon the size of your group. 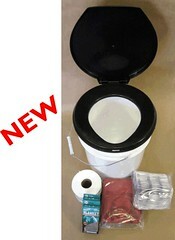 Have portable toilets, bags to enclose waste, disinfectants, etc. Consider how you will contain & dispose of garbage.